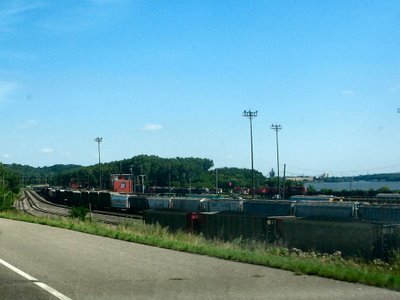 And have it on Highway 61....this train yard is on Highway 61, yes the highway 61 from the song that Bob Dylan made famous. This train yard is in St Paul, but just barely. It's down about as far south as the St Paul borders go. The Mississippi River is to the right, the red shed looking building is the control room for the train yard. There is a walkway that crosses over the tracks to a parking lot that runs along Highway 61 south. I really like this area because it's really a beautiful place, but it's not seen by many because it's more of an industrial area. There is a metal scrap yard down the road, the train tracks of course, a couple of oil refineries and on the other side of the river are a couple more businesses that use the river to transport goods or supplies to keep their businesses up and running. It's more like this area is hidden because of what we have built around it. It couldn't be further from that. It is very scenic, despite the man made structures. Love trains. Love your sentiments.